"See saw up and down, around and around we go..."
2 steel springs (in our application), when bent, serve 2 main functions: 1) They create a resistance to the 'downward' pull that the coils exert on the armature bar, by pulling the armature bar in the opposite 'upward' direction (rear spring) & 2) Control the speed (front spring) and force the armature assembly will bounce back (after making contact with the contact screw) to the coil (with the aid of the coil's magnetic pull). Springs usually are used in pairs; a rear spring and a front spring. Though a "one piece" spring may be used (p. 51), the spring "pair" combination produces greater variability and versatility in the intended uses of the machine and each (spring) has it's own job to do. Machines usually use a pair of springs, a front and a rear spring. These springs are usually made from "close grain high carbon spring steel" or "strapping steel". An excellent example of a high cuality spring steel is found in automotive "feeler gauges". 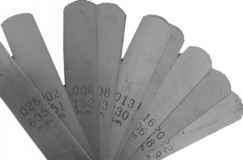 This is a set of feeler gauges ranging from thick to paper thin. These are generally used for gapping spark plugs, another example of spring steel can be found in the steel "straps" used to hold 2x4's together, usually in shipping. The strapping steel has a 'blue' look to it, the steel these straps are made from are treated. This treatment affects the rigidity of the material. Generally, springs made from this 'blue' steel, feel harder and have less flex than a "feeler gauge" spring of the same gauge. Simply put- a blue .018 gauge spring usually will feel stiffer than a feeler gauge non-treated .018 spring. If you have this type of spring as your only option, experiment with shapes that improve flexibility, if the spring is too stiff (see "Spring width and shape" section p. 25). Be sure you test the flexibility of the material before using it as a spring for your machine. Hold a piece between both hands, about 1" between your thumbs and place your pointing fingers on the ends of the material and bow it, see if it springs back. If it doesn't spring back and stays bent, it is not worth using as it may crack, or not have the resistance needed for a smooth running versatile machine. Using low quality springs can cause the machine to sound and run exactly the same way it would if there were electrical power-surges going through it. The smaller the (standard) number on the spring stock, the "thinner" and more flexible the stock, the larger the number, the "thicker" and less flexible the spring stock. A machine will have to work harder to move a harder (thicker) spring (.019, .020, .021) because the flexibility is limited, this can also happen when there is too much tension on the rear spring. Generally, spring gauges used are inch measurements, the number .018 has an equivalent metric measurement of .457. A .017 spring has a metric equivalent of .432, so in metric, it is the same, the greater the number, the thicker the spring gauge. An .018 in front used in combination with a .017 in back may be ideal for the proposed function of your machine. Maybe the drilling specifications on a particular frame may require the stiffness of a .019 rear spring and a .018 in the front. The tension of the rear spring will dictate the amount of compression on the front spring which, in effect control the speed of armature bar/needle bar movement and force of needle penetration... that is, if the front spring is a thin enough gauge to have some flex, and it should have very little. If it doesn't, it may be too thick of a gauge, we recommend to stay around .017 and .018 for a front spring (see Spring Tension test p. 60). Remember, the power supply controls the force at which the needles will penetrate (not the speed) when encountering resistance from the skin. When doing a black and gray piece, a machine may run at a lower setting (on power supply) on the customer with softer skin (to achieve a smooth perfect gray) and may need to run at a little higher setting on someone with tougher skin, in order to achieve the same "smoothness" of shading. The tension of any spring is affected by it's thickness / gauge and will directly influence the quality of penetration and resistance the needle grouping will encounter, controlled of course by the regulated power supply. The goal is to regulate tension, (bend), gauge of the springs, in conjunction with the pull from the coils magnetic field, which is con-troled by the power supply's dial. You can make these springs yourselves or buy them already cut. To make springs, see the "Cutting Springs" section, Chapter 4 - p. 29. The assembly of a spring / armature bar set up is as follows— bottom to top: armature bar, rear spring, front spring, washer, screw. TIP-any washer used directly on top of a spring should have any sharp edges gently filed off, this sharp edge can increase the risk of a spring breaking in the particular area the sharp edge pushes into the spring material, the movement of the armature bar and the flex of the spring material, will speed up the breaking process. Gauges of spring steel needed for proper function will vary according to the specifications of the tattoo machine and weight of the armature bar / components associated with the armature bar. Generally, we recommend a .017 or an .018 front spring and a .018 rear spring combination...though different gauges may be used to compensate for differences in frame design and drilling specifications, or weight of the armature bar. The flex of the .018 spring (usually) has the standard ideal flex / stiffness for a perfectly versatile and well tuned machine. Though, on occasion, an .018 may be a little stiff for a rear spring if the spring saddle is very close to the back of the armature bar, where a .017 gauge spring may be the ideal gauge to use. Generally, springs used will remain between .017 and .019 for the rear spring and .017 and .018 for the front spring. 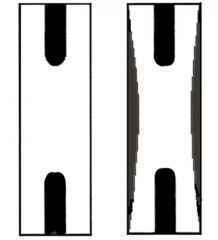 Spring width and shape *A question: You have 2 pieces of spring steel stock, both are identical in thickness and in width, but one is longer, which one will be harder to bend? The short one will be "stiffer" and have less flexibility when bent by holding each end, the longer one will be more flexible. 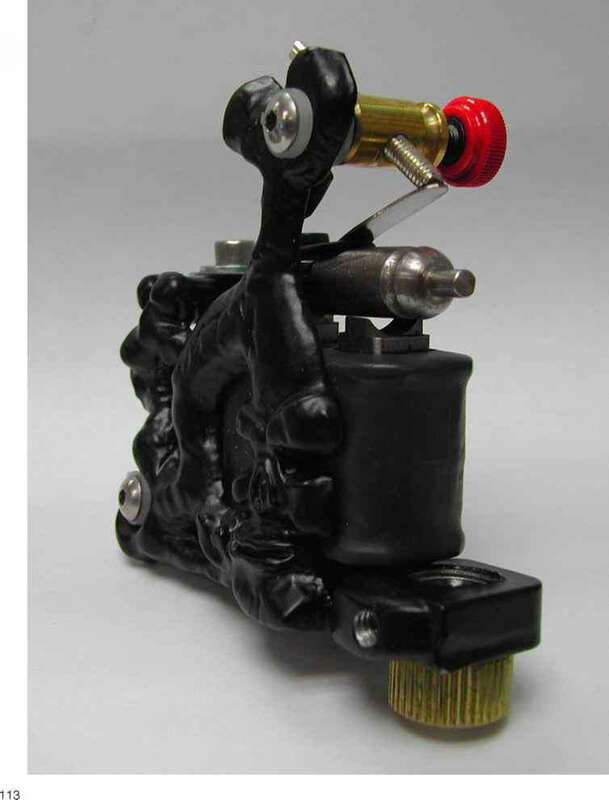 This principle is important because in the tattoo machine application, tension on the springs is created by bending or un-bending the springs, or shortening them. If the distance between the spring saddle and the front of the armature bar is too great, and the gauge of "rear" spring stock is not thick enough there will not be enough tension / leverage to move the armature bar at a force acceptable for proper needle penetration in to the skin, no matter how big of a bend you put in the rear spring; remember the rear spring has to deal with the following: armature bar weight (including it's assembly components), needle bar weight, grommet weight, rubber band tension, how many needles must be forced into the skin and the skin type. 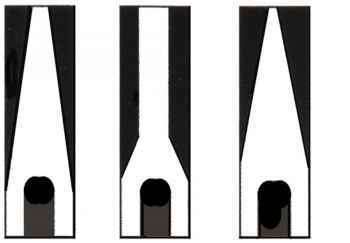 A thicker spring gauge may be considered if needle penetration is not adequate. *A second question: You have 2 pieces of spring stock, both are identical in thickness and in length, but one is thinner in width, which one will be more flexible? Easy. Using this principle, solve this problem: You have a rectangular piece of spring stock which needs more flexibility. What could you do to this rectangular piece of stock to increase flexibility? Change it's shape-cut, file, hole punch...removal of stock on each side of the spring will increase flexibility and reduce tension, as will removing stock from the center (See illustrations on the next page). This seems so simple yet a big percentage of artists cannot diagnose this problem and would not know how to fix it. Do not be afraid to experiment with different shapes and thickness of your spring stock. The springs are possibly the most important ingredient in the function of a smooth and versatile machine. Ideas for front spring shapes. Ideas for rear spring shapes. Some artists say that bending springs may shorten the life span of the spring and cause it to break sooner. We have all seen the armature bars with angles milled into them to accommodate an unbent front spring. The same could be done to the spring saddle to accommodate an unbent rear spring. The theory stating that "bends in the spring will shorten the material's life" may be true but we have no choice unless we use angled spring saddles and angled armature bars. If you don't use those bars, you must regulate the tension on both springs by bending or unbending them. Another point to bring up regarding these armature bars with angles milled into them, even though they are a novel idea and very inventive (invented by Bill Baker of Eikon Device in Toronto, Canada), it's important to state that these require 2 screws and or 2 washers to secure the springs to them...this adds weight to what the rear spring already has to carry and may require a thicker rear spring gauge to move them correctly, so keep this in mind if this your choice of armature bar, use the correct spring gauge! Angled armature bar. Note the extra weight the rear spring has to deal with, an extra screw and washer added to it's already existing burden. Remember, the tension on the rear spring will decide the compression of the front spring, and that the front spring will compress according to it's gauge, the thinner the front spring, the more flex it will have. This directly affects the application of the tattoo. The gauge of the front spring is just as important as the gauge of the rear spring. The front spring partially influences the movement of the armature bar which directly affects the needle bar's force of movement. So a thicker stiffer spring may work well for lining with larger groupings as it causes more counter resistance than a softer, thinner spring would, but it can also determine the abuse the skin may have to endure if there is not enough flex to deal with the resistance the skin will produce against the penetration of the needle groupings. A stiffer front spring will also limit the versatility of the machine's function to a strictly coloring machine or a power liner but will also make the machine have to run at a higher setting on the power supply and may even cause the machine to heat up. The technique to gray shade consistently and smoothly by turning the dial on the power supply "down" will not work properly if the springs are too stiff, and if there is too much tension on the rear spring. We believe that each machine should have the capability to outline, shade and color with the particular grouping being used, including a single needle. This enables the artist to excecute small tattoos with the same detail as a larger tattoo, provided that he/she has the skill to use small needle groupings. This brings up another problem. Being familiar with the armature bar and it's assembly, answer this question: You have a .016 or a .017 spring in front (these gauges are used as an example based on the understanding that the .018 gauge spring is the "ideal" standard spring to use) you can use the machine just fine with a 5 or 7 magnum for black and gray shading or lining with a single needle and a tight 3, but cannot use a larger liner grouping to line with it or color solidly with it, what would be the cause? The resistance of the needles penetrating the skin causes the thin .016 or .017 front spring to flex thus allowing the needle bar / grouping to "back off" from the skin upon contact, and not allow the needles to penetrate the skin deeply enough to inject the color solidly. You will need that front spring to be stiffer and don't have and .018 to change to, what can you do?... using the principles described above. Shortening the front spring by cutting it and move your contact back is one way (be sure to set your stroke and tune the machine after cutting the spring and moving the contact screw back) , why? Because a wider, shorter spring stock will be less flexible in terms of leverage—front to back--tip of the spring to the back where it is secured to the armature bar. What else could you do? O-rings come in a variety of thicknesses and diameters. 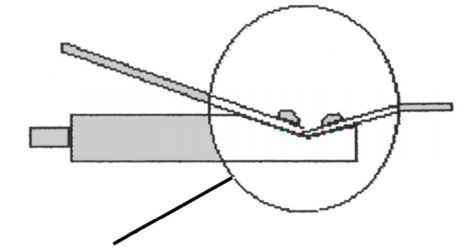 When placed under the front spring and over the armature bar assembly screw or under the front spring and behind the back of the armature bar, the 'pull back' on the front spring can increase tension. A thicker o-ring will move the point of flexibility closer to the tip of the spring thus shortening the available spring stock and increasing tension (lessening flexibility) on that front spring. Though ideally, the spring should be changed to a thicker gauge and an O-ring added. O-rings provide a shock absorber under the spring and make for a smooth running machine-careful with the thickness of the O-ring. Cutting back the front spring and O-ring placement. moving the contact screw back. When modifying a thicker spring gauge by slimming it down (removing stock in order to increase flexibility and lessen tension) the flexibility of the .018 gauge spring usually has the ideal flex to move and support the weight of the armature bar, it's assembly components (screw, washer, front spring, o-ring, grommet/tape/paper towel, needle bar, needles) as well as resistance from the rubber band and the resistance from the penetration of the needle grouping into the skin-suntanned or tougher skin will affect counter resistance on the front and rear springs as well. The front spring deals mostly with the resistance from the penetration of needles into the skin, more so than the rear spring, though the rear spring is also affected. .why is your machine heating up? Maybe you should check the gauge and tension of rear spring. Or maybe your rubber band is too tight. Similar to an overheating car, a machine can heat up if it's struggling to move the armature bar due to increased resistance (too stiff of a spring, too much rubber band tension and weight of the components (armature bar assembly). A machine heating up may be a symptom of another cause as well.carbon build up on the contact screw interferes with the flow of current and makes the machine work harder. 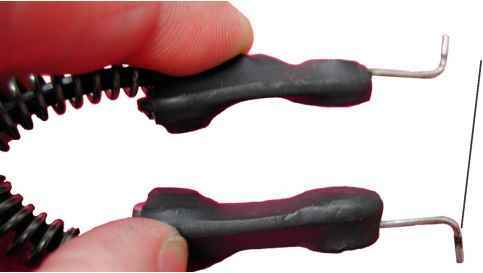 It can also build up on the clips on the clip cord, so watch for it and remove it if necessary. From constant use, the metal clips will develop wear in the form of grooves worn into them, these can be filed down to smooth these out but eventually, the clip cord clips should be replaced. A clip cord is easy to build and maintain, as is the footswitch. __ These grooves can allow for a build up of carbon and should be cleaned periodi-caly with a fine sand paper, wire brush, steel wool or a small file. Black with grey shading tattoo arts are like a representation of who you are and they have a power and magic of their own. This Tattoo tutorial is covering how to do black and gray portrait tattoo techniques. 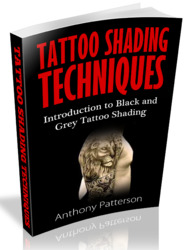 Learn about black with grey shading tattoo art and explore the exceptional techniques of making some beautiful designs. What happened to bill baker and eikon device? What can cause a tattoo machine to heat up? How to shorten a front spring on a tattoo machine? How to tune machine where duty stays constant tattoo? How to bend a one peace tatto spring? Which is the deeper lower sound in a machine liner tattoo? Is the armature on a tattoo machine flexible? How to use feeler gage on tattoo machine?